What Makes a Chimney Waterproof? In the colder months, you want to be able to keep your home warm with plenty of cozy fires throughout the winter. But most homeowners rarely think about their chimney until it starts to leak! When your chimney leaks, it can become difficult or impossible to use your fireplace. Worse, you risk more serious damage to your home if you do not address the problem promptly. Knowing what makes a chimney waterproof can go a long way towards making sure you recognize problems before they become major. Different types of chimneys have different needs when it comes to waterproofing. That said, whether your chimney is made of stone, brick, or stucco, there are some major elements that in all chimneys that come together to keep water out. The chimney crown, masonry pointing, and the flashing in particular must be kept in good shape. Under the chimney cap and opening is the chimney crown. 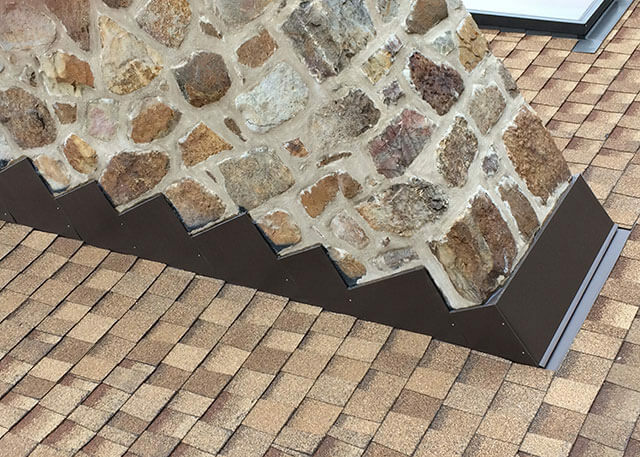 This sloped mortar surface keeps water from getting into the masonry below it, whether that is stucco, brick, or stone. Cracks or other deterioration around the crown can cause not just leaks on their own, but they can cause a breakdown in other important elements of the chimney. If the crown breaks down, it is only a matter of time before the siding below it also starts to crack and leak. If any issues with the crown are visible, be they cracks in the surface or around the edges, it is worth a homeowner’s money to get them repaired as quickly as possible! The Greater Delaware Valley is no stranger to cold, wet weather. In the winter months, your chimney is subjected to the freeze and thaw process. This refers to the wear and tear effects that cold weather can have on your chimney. Mortar, the substance that holds the bricks or stones of your chimney together, is made of a mixture of water, sand, and concrete. During the cold months, water is absorbed by the porous surface of the mortar that is in between your chimney’s bricks or stones. Low temperatures can cause the water in the mortar to freeze, which in turn causes weakening, cracks, and deterioration in the masonry over time. If left unchecked, this can cause your chimney to shift and even collapse. As the weather warms up again, moisture can enter the chimney through the cracks in the mortar and cause further damage to the chimney and to the walls and ceilings in your home. McNamara Masonry Restoration has over 25 years of experience repointing existing mortar joints. Repointing is the process of replacing the old mortar holding your chimney bricks or stones together. At McNamara Masonry, we always repoint the entire chimney. Experience has taught us that patch pointing, or replacing some of the old mortar joints and keeping others intact, is ineffective and a waste of time and money. Complete repointing ensures that a deteriorating masonry chimney is repaired thoroughly, not just patched up here and there. Repointing will allow your chimney to remain waterproof for years to come while also improving its overall appearance. If your leaky chimney is made of stucco, it may be that the stucco was applied directly over cinder blocks without wire lath. If this is the case, our experts can fix the problem. Wire lath is material used as scaffolding between the stucco and the cinder blocks, and is essential for keeping your stucco chimney waterproof over time. We will attach the wire lath and then refinish the stucco using a thorough, three-step finishing process. With many different finishes and textures to choose from, the end result will be both waterproof and attractive. The flashing is the sheet metal that keeps the juncture between the chimney and the roof watertight. Over time, this material can deteriorate from the effects of temperature changes and the elements. As this happens, water can start to enter your chimney from the bottom. If the flashing is in need of repair, we can expertly replace your copper or aluminum flashing and recreate that all-important watertight seal. Read more about our flashing installation process here. We will also install a “cricket” if necessary to help prevent rainwater from overloading your chimney. Very steep roofs benefit from this small, triangular structure built along the high side of the chimney to help divert the flow of water from the masonry chimney. It can prevent water from draining heavily onto the most vulnerable part of your chimney. 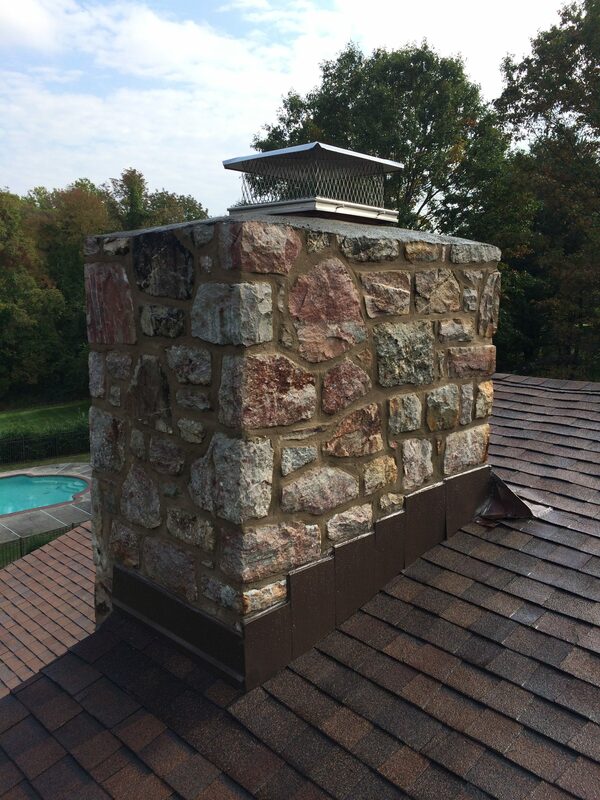 McNamara Masonry Restoration provides reliable, expedient, and expert service when it comes to chimney restoration and repair. Our many satisfied customers throughout the Delaware Valley agree! If your chimney is showing signs of a leak, it is imperative that you make a call now to prevent more serious damage in the years to come. Your home is your most highly prized asset, and keeping it in good repair is an investment in your future. We stand by our work with a 5-year labor and materials guarantee. Call today to set up a chimney evaluation!